Would you like to reduce your energy bills whilst improving your environmental performance and credentials? 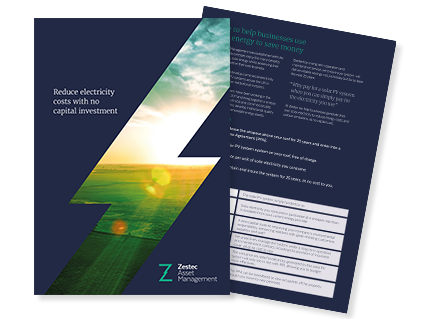 A Power Purchase Agreement from Zestec could be your perfect solution. If you have a building footprint of at least 450m2 and consume at least 80,000 kWh of electricity per annum in a regular daily pattern, then, thanks to our PPA, you could benefit from cheaper, greener electricity today, whilst protecting your business from future energy price rises for the next 25 years. How? By installing a commercial solar PV system on your property, completely free of charge. All of the electricity the system generates will be available for you to consume, at a low fixed rate, which is guaranteed to increase only with RPI for the next 25 years and you will also save tonnes of CO2 every year. Zestec will work together with you to design and install the highest yielding solar PV system for your business, all at no cost and with very little disruption. Once installed we monitor, maintain and manage the system to ensure peak generation, therefore providing optimum savings for you, at all times.